My regular readers probably already know that I’m away on a little mini-vacation this week. I made these little treats last week, took all the photos, and uploaded them to my server so that I’d have everything at hand to complete the post from down the shore. Little did I know, at the time, how appropriate they’d end up to be! It’s drizzly and gloomy today. That hasn’t stopped my boys from wanting to spend the afternoon on the beach, but I did it yesterday, and I’m not so jazzed over the idea of spending another day feeling shivery, clammy, and gritty. So I’m sitting at a coffee shop with the computer on my lap, writing to you guys about my latest kitchen creation. Don’t these photos just put you in mind of a rainy day? I love that. I actually really love rainy days, and especially when I can spend them curled up in a cozy quiet place like this. I hope you’ll give some of these tunes a listen. They’re guaranteed to make you feel peaceful and happy. And I hope you’ll give this flavor combo a try. It’s seriously outta this world! A tablespoon of instant espresso granules go into the ground almond mixture, tempering the sweetness of the shells with a slightly bitter, toasty richness. The chocolatey Nutella spread is the ultimate compliment. And it’s so simple- just scoop it straight from the jar and spread the happy. These are without a doubt the best tasting macarons I’ve made to date. Measure the almond flour, powdered sugar, and espresso powder into the bowl of a food processor. Pulse the mixture to a fine powder, and sift. Re-process any large bits that remain, and sift again. Discard any large bits that still remain. Whip the egg whites, cream of tartar, and salt on medium speed until frothy. Slowly add the granulated sugar (about a teaspoon at a time), while continuing to whip. Once all the sugar has been incorporated, turn the speed up to high and whip until the meringue looks glossy and holds stiff peaks. Preheat the oven to 325 degrees F and bake for 15-16 minutes. Cool completely on the baking sheet, then peel off and sandwich with Nutella. And with that, I’m going to sign off for the week! Again, I’m travelling all week, and while I was hoping I could get a post together for you for Friday, unfortunately (due to some other deadlines) I was not able to make it happen. So- you get a nice long break from me, lol! I’ll be back on Tuesday with another great coffee treat for Mystery Dish. Hope you all enjoy the rest of this lovely week! 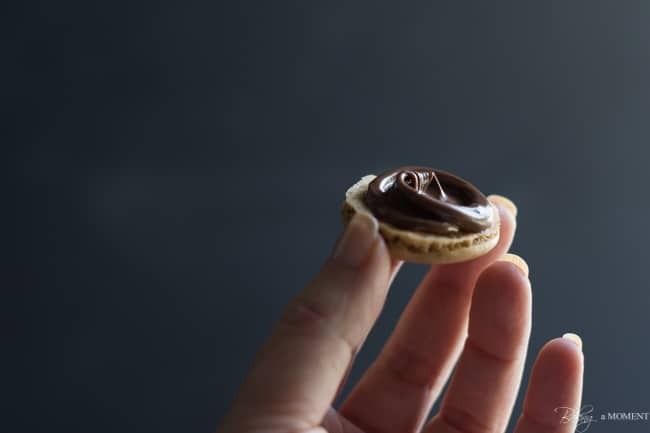 Disclosure: Compensation was provided by the makers of Nutella via Mode Media. The opinions expressed herein are those of the author and are not indicative of the opinions or positions of Nutella. I must say I’m completely in love with your pictures! They’re perfect to express the beauty of a gloomy, rainy day! 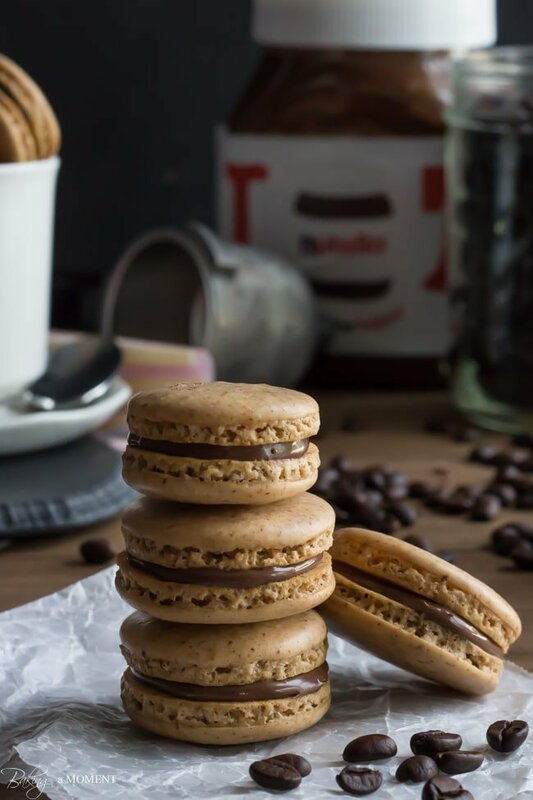 And the macarons sound amazing – I can’t get enough Nutella, and it looks perfect paired with coffee! Thank you Consuelo! It was all just a lucky accident, lol. It wasn’t until later when I went back to write the post that I noticed how “rainy-day-looking,” the pics had come out. I’m so glad you liked and thank you so much for the sweet compliments! 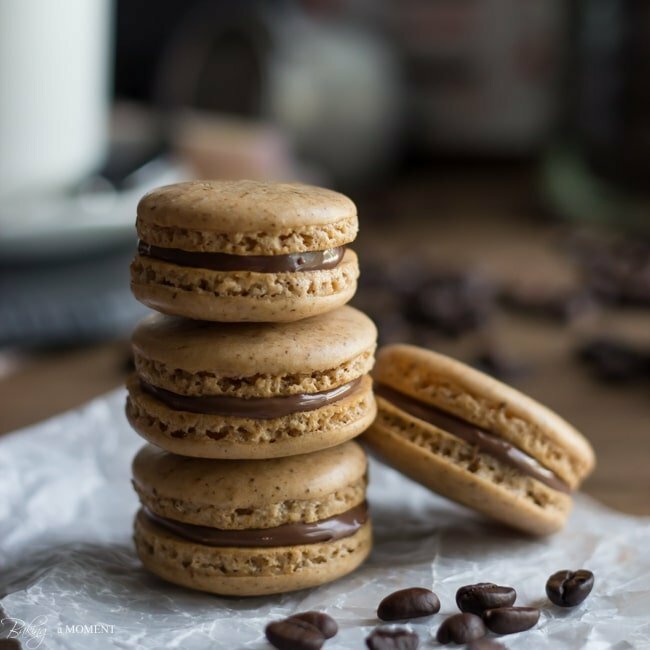 Allie, you made coffee macarons?! these are a thing of beauty!! Amazing! Oh my goodness, how sweet is that? Absolutely darling! 🙂 And these macarons are just gorgeous. I have so many blogger friends who make them look so easy … I think I’m going to have to give these a try. Pinned! And love the Nutella addition! Love these Allie, they look amazing!! Awesome flavors. Thanks Matt! I really loved the coffee, hazelnut, chocolate combo. Thanks for reading and commenting! These look and sound amazing! Aren’t macarons so addicting? Once you make them once, you just want to try so many flavors! So true. After making your blueberry ones I had macs on the brain! Can’t wait to do them again now, lol! These look gorgeous Allie! As you macs always do. Hope the sun shines through at some point during your mini getaway. 🙂 Love ya! Thanks dear! I did get quite a few sunny days after the weekend was over. It was great! smooches! I have certainly learned my way around a jar of nutella this summer! Thanks so much Melanie! Absolutely beautiful macarons! Love the nutella filling! i am a sucker for any macaron.. yours a seriously perfect! 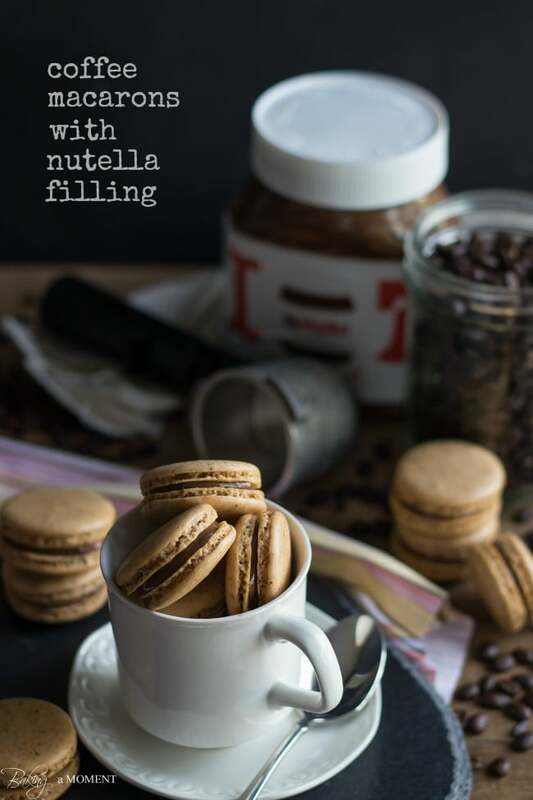 never made macarons with nutella filling before, definitely something i will be trying. they look divine, thanks for sharing! Oh ya, it’s a must try for sure! So delish and so easy. The shells are hard enough without having to worry about a fussy filling too! Thanks so much for the awesome feedback, Thalia! Allie oh Allie now I were what you meant. When you told me the other day you just made the best macarons I couldn’t believe it but seeing these I’m in no doubt!! 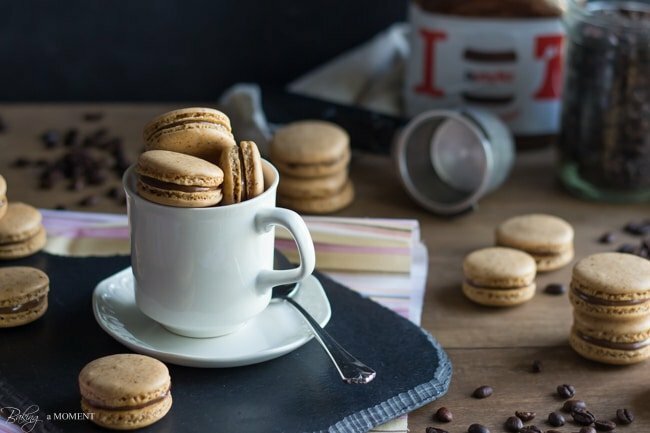 Coffee macarons? I’m in love!! I’m also in love with your rainy day coffee shop date and music selection. Love that Jason mraz song…was my anthem for a long time and almost our wedding song. Instead our first dance was to collie callait and Jason mraz duet lol! Have a great rest of your vacation!! I love all your beautiful looking and creative macaron flavor combos including this one! Coffee and nutella sound amazing together! Aaaw so sweet, yes mothers and sons can definitely have a song 🙂 Pinning and hope you’re having a great holiday! Thank you Kelly! It was a nice time and now I’m finally getting back to normal again. Hope you’re enjoying a lovely week! And so my love affair with Nutella continues with this recipe. Jotting it down to make soon! My love affair is growing ever more ardent, lol! These macs played a big part in that! Thank you so much sweetie! My life is made! These are amazing! These look awesome! I can totally feel the rainy day ambiance through my computer screen! I have so much trouble making good macarons, but these look too good to pass up! I am always so in awe of anyone who can make macarons. These look perfect! It’s funny, Allie, because I’m sitting here right now at home feeling all cozy because it’s raining buckets outside. Sort of love it and sort of hate it! Hope you enjoy your little break! I know just what you mean! It’s love/hate. Mostly love for me though, I’m kind of a homebody 😉 Thank you so much for the sweet comment, love! Thank you so much Layla! For the sweet comment and the pin too. I’m so glad you enjoyed! Coconut and chocolate—-Nirvana food. How do you get them to be soooo perfect. I am so impressed. As a macaron afficonado, I must say that these look great! Nutella too … miam miam! Isn’t it just so cozy? Thanks, Teresa; hope you’re having a nice weekend! I just finished making these, they’re so delicious! Instead of Nutella I used dark chocolate ganache, though. I’m dying to make a million different flavors! Hooray! That’s why I love macarons so much- the possibilities are just endless! So happy you like them Mary; thank you for the awesome feedback! Hi Allie, I just baked two batches of macarons and both were disappointing cos they were ‘feet less’! And as I was looking at the troubleshooting websites, l chanced upon your awesome website. I plan to give your recipe a try…before I do that, i have a question: Do you need to ‘age’ the egg whites cos your recipe didn’t mention about that. Hey Grace! I’m so glad you found yourself here! Hopefully I can help bring you success/feet 🙂 I do sometimes age them a bit- so, if I’m on top of my game, I would separate the eggs the night before, and keep the whites out on the counter to come up to room temperature. I think it helps! I have a video tutorial for basic macarons, you can check it out here. Good luck and thanks for reading! 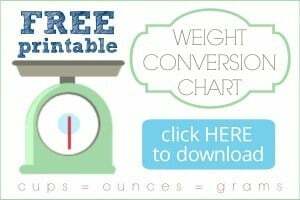 how many eggs are 100g of egg whites? It ends up being a little less than 3, Tylana. Hope that’s helpful! These look fantastic! If I don’t have almond flour is there a substitute? Hi Julie! Any kind of nut flour should work. You can also make your own by grinding in a food processor. Just be sure to sift out any larger bits. Good luck and enjoy! these are darn near perfection!! Hi Allie – I see specks in the shells which I like. Is this from the espresso powder? I was thinking the powder would dissolve?